If you're running CSS HTML Validator using Wine, then please let us know! 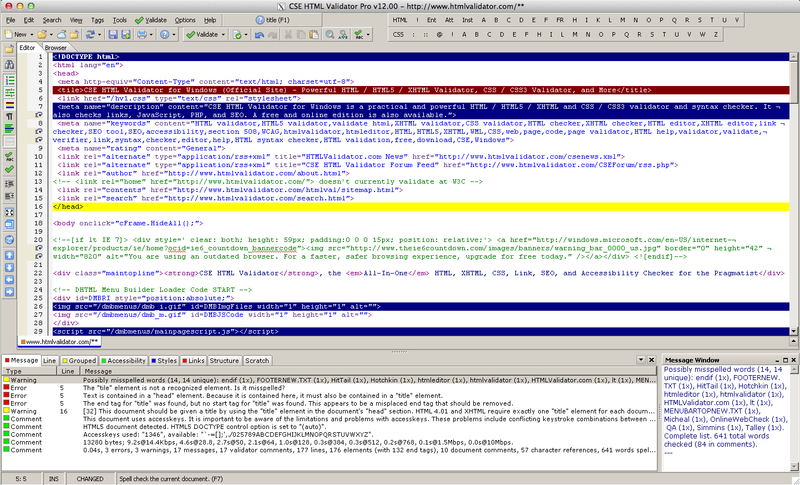 The above is a screenshot of CSE HTML Validator Pro v12 running on Mac OX X 10.8 (Mountain Lion) under Wine. Click it to see a larger view. Great to see some real world examples of some level of OS interop! It's been over 5 years since the original post! Here is an update from someone who is using CSE HTML Validator Pro v15.05 (an older version but I suspect newer versions should operate similarly) under Wine 3.0 on Linux Mint 19.0 64-bit. 1. The integrated browser won't start. 2. The UI fonts look terrible. Although they are readable, they look small, thin and low resolution. 3. There was no sound. That may be a more general Wine issue with lack of PCM sound files being installed at first. I solved this by copying a load of Windows sound files onto my Linux home partition. 4. Interaction between main and batch windows is sometimes peculiar. Not a very technical description, I know, but hard to explain and reproduce. For example, sometimes you click a panel icon to restore a window and nothing happens, or the wrong window gets restored (e.g. main one instead of batch wizard one). So, while not an optimal experience, you can use CSS HTML Validator on Linux with Wine.